This year’s Nobel Prize in Physiology or Medicine was awarded to James P. Allison and Tasuku Honjo. Their breakthroughs in cancer research have allowed scientists to fashion highly effective drugs which reactivate the body’s own defences against cancer cells. The war on cancer has generally been thought of and presented as a battle that is waged between scientists and doctors armed with either chemotherapeutics, radiotherapy or other approaches on the one side and the malignant cells on the other. 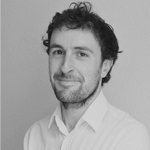 But what if cancer therapy wasn’t focused on targeting the tumours directly – in reality often a messy and imprecise approach – but on reactivating the body’s latent ability to identify and eliminate cancerous cells? We humans possess highly sophisticated and complex immune systems that protect us from foreign invaders such as bacteria and viruses but also from cancer, the enemy within. Scientists have long appreciated that cancer and the immune system are intimately linked with each other. Paul Ehrlich, who shared the 1908 Nobel Prize in Physiology or Medicine with Ilya Ilyich Mechnikov for elucidating the fundamentals of immunity, already hypothesised that cancer cells can be both recognised and eliminated by the immune system. In the 1950s and 60s, Lewis Thomas and the Nobel Laureates in Physiology or Medicine in 1960, Frank MacFarlane Burnet and Peter Brian Medawar, built on this idea and developed the concept of cancer immunosurveillance, which states that cancer cells express specific proteins on their surfaces that can be recognised by circulating cells of the immune system, leading to the mounting of powerful immune reactions directed against the tumour cells. However, owing to its destructive potential, immune system function must be tightly regulated in order to ensure that it doesn’t do damage to the body’s own cells. Further, cancer cells actively suppress the immune system in order to promote their survival and spread. By gaining a molecular understanding of the brakes that act on T cells, specialised cells of the immune system that attack and destroy foreign invaders as well as cancer cells, James P. Allison and Tasuku Honjo have figured out ways to disable these brakes, thus directing the immune system to kill cancer cells. As with many important scientific discoveries, the road was a long one, and while attractive to many, the concept of stimulating the immune system to attack and eliminate cancer remained an unconventional research niche for many years. Already in the 1970s, Allison and colleagues had found a mechanism whereby the immune system was inhibited from efficiently targeting cancer cells, one which involved the interaction of tumour proteins with other proteins. Then, in the late 1980s, a novel protein called CTLA-4 was discovered on the surface of T cells. James Allison and his laboratory could show that it keeps the immune system in check by restricting T cell responses. Allison then hypothesised that if the function of the CTLA-4 protein could be blocked then this might release the brake that was preventing the immune system from eliminating cancer cells. He went on to use an antibody to block CTLA-4 function in mice with cancer. This had the effect of reactivating T cell function and led to a complete eradication of cancer in the mice. In parallel to Allison’s research, Tasuku Honjo and colleagues in Japan had in the early 1990s discovered another protein expressed on the surface of T cells that they termed PD-1. Further experiments showed that PD-1 also restricted T cell function. Following the same rationale as for CTLA-4, blocking PD-1 function and thus relieving the brake on T cell function was adopted as an anti-cancer strategy. Legend: Illustration of the mode of action of immune checkpoint inhibitors targeted at CTLA-4 or PD-1. Left panel: CTLA- 4 functions as a brake on T cells by inhibiting the function of an accelerator cells required for T cell activation. Antibodies (in green) against CTLA-4 release the brake and prompt T cells to attack on cancer cells. Right panel: The PD-1 brake also prevents T cell activation, and antibodies against PD-1 release this brake allowing T cells to effectively kill cancer cells. Image source: Press release: The Nobel Prize in Physiology or Medicine 2018. NobelPrize.org. Nobel Media AB 2018. Mon. 19 Nov 2018. However, it still remained unclear whether approaches targeting these proteins could be effective in treating cancer in humans. In 2010, a clinical study using an inhibitor of CTLA-4 showed impressive results in patients with melanoma, while the results of a 2012 study in which PD-1 function was inhibited in lung and other cancers showed similarly dramatic recovery rates. The results of these and other trials are particularly exciting as lifting immune blockade can also lead to complete eradication of cancer in patients with metastasis, i.e. with cancer that has already spread through the body from its primary site. Such advanced-stage cancers are notoriously difficult to treat using conventional cancer therapies. The overwhelming weight of evidence was by now too much to ignore, and the journey of cancer immunotherapy from the sidelines to the mainstream was complete. By 2013, Science magazine had named it as their breakthrough of the year, and six so-called immune checkpoint therapies that target CTLA-4, PD-1 and another protein on the surface of T cells, PD-L1, have now been approved for use in patients. 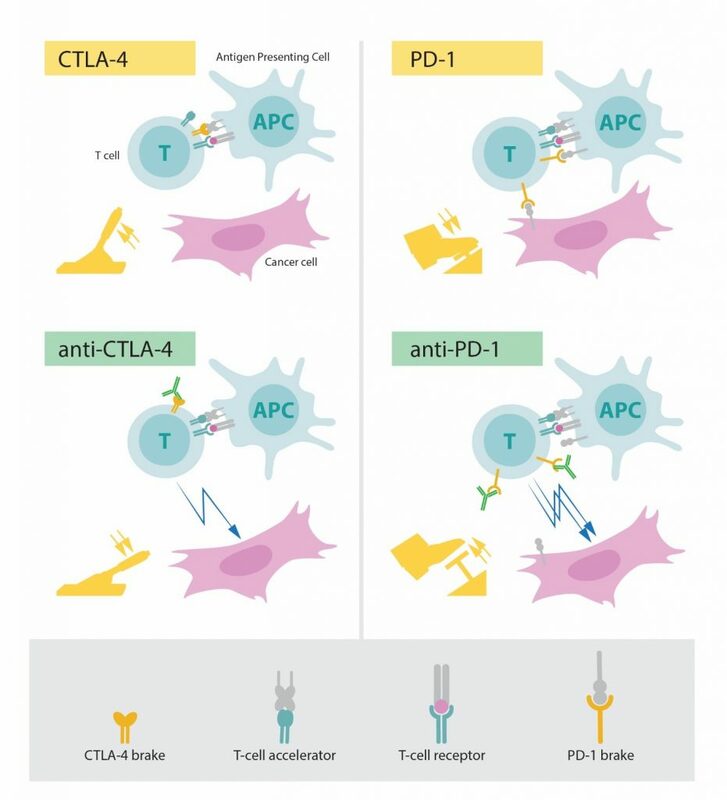 Allison and Honjo’s equal share of this year’s Nobel Prize in Physiology or Medicine is also apt for very practical reasons, as the effectiveness of immune checkpoint therapies seems to be increased further when both CTLA-4 and PD-1 are targeted simultaneously. Is there a catch to all this? One major caveat associated with these therapies is that side-effects resulting from enhanced immune system function, such as inflammation, must be carefully monitored and controlled. Nevertheless, cancer immunotherapy has brought about a revolution in how we think about and treat cancer and in the years to come will surely save countless lives. Additional Note: An interesting Topic Cluster on the history of immunology can be found in our mediatheque.